Florida Democratic activists love Andrew Gillum. They seem oblivious to the investigation. One Democratic candidate for governor draws big crowds in Tampa Bay. A public corruption investigation looms over him. Four major candidates are running for the Democratic gubernatorial nomination in 2018, and each regularly visits Tampa Bay to court voters and donors. Only one consistently draws sizable crowds of activists. "Andrew Gillum is definitely my candidate," said Sheira Hope, a St. Petersburg homemaker, before an online debate between Gillum, Tallahassee's mayor, and Republican House Speaker Richard Corcoran. "I like his energy, I like his ideas, I like his honesty." 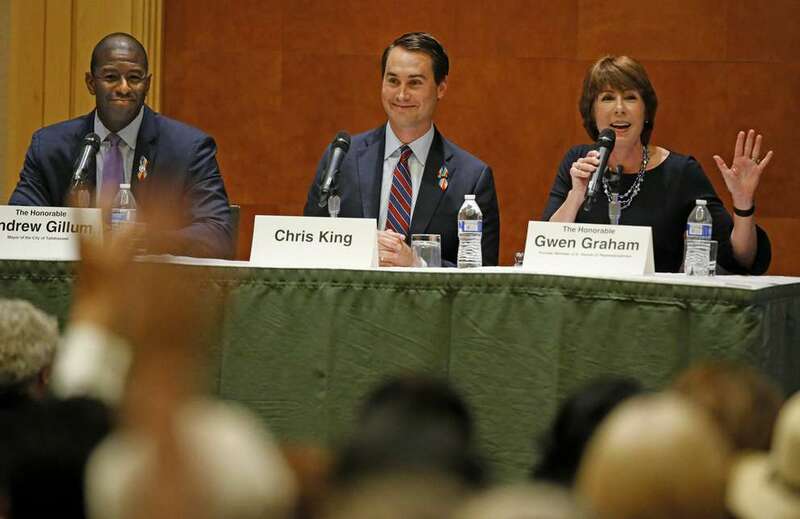 Democratic organizers throughout Tampa Bay say it can be a struggle mustering decent crowds when former congresswoman Gwen Graham of Tallahassee, businessman Chris King of Winter Park or former Miami Beach Mayor Philip Levine campaign here. Not so with Gillum, a charismatic speaker and proud liberal aggressively courting the Bernie Sanders wing of his party. "That's definitely true. He is the favorite of the more progressive members of the party," Hillsborough County Democratic Party Chairwoman Ione Townsend said. "People are really looking for somebody that is hopeful and inspiring, and Gillum really meets that," said Women's March Pinellas organizer Lisa Perry, likening Gillum's grass roots enthusiasm to the kind generated by Sanders and Barack Obama. "Gillum may have the least funding, but he's created a really big ground game here already." Those sentiments are widespread among liberal Democrats, which is pretty remarkable given that just a few months ago the most common question about Gillum's candidacy was why hasn't he pulled the plug. Much of the party establishment wrote off Gillum amid revelations eight months ago that Tallahassee City Hall was the focus of a public corruption investigation. Fundraising all but dried up as the Tallahassee Democrat spit out ominous news nuggets: A federal grand jury last summer subpoenaed five years of city records related to redevelopment deals and developers, including a longtime friend, lobbyist and political ally of Mayor Gillum's. … The FBI interviewed Gillum, who stressed that the FBI told him he was not "the focus" of their investigation. … A photo showed Gillum on a boat in New York City in 2016 with his lobbyist friend — Tampa native Adam Corey — and an undercover FBI agent who had been posing as a developer looking to do deals in Tallahassee. A couple of dozen Democratic activists gathered at St. Petersburg's Queens Head restaurant earlier this month to watch Gillum's debate with Corcoran. They talked about Gillum's youth, his agenda, including Medicare for all and a $15-an-hour minimum wage, and his potential to excite the Democratic base in a way that avowed centrist nominees in the past four gubernatorial races did not. 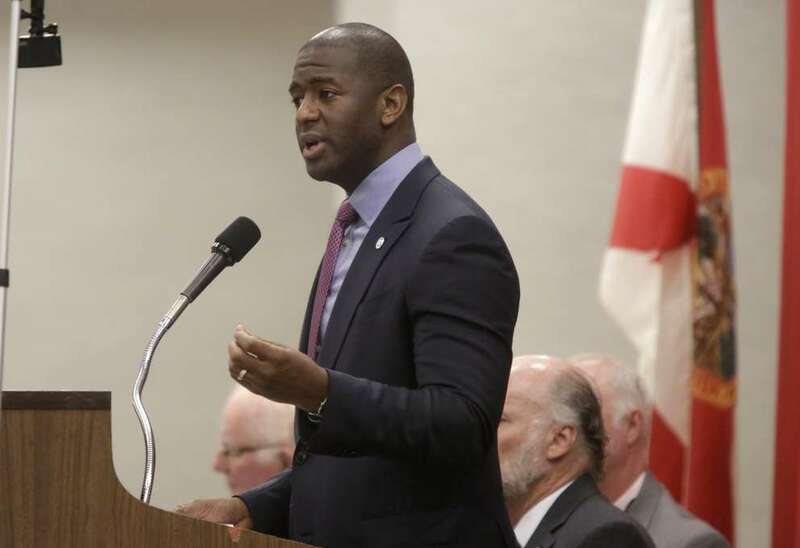 "He knows what normal people have to go through to make a living," Ray Kervahn, a retired sales manager, said of Gillum, the African-American son of a construction worker and school bus driver and the first person in his family to attend college. Asked about the corruption investigation looming over Gillum's candidacy, person after person called it a non-issue. "The information I have is that he has been cleared of all charges," Hope said. Perry said concerns about that investigation used to be common, "but lately most of those fears have been put to rest." Gillum, 38, has not been implicated in any wrongdoing, but that does not mean he has been cleared. 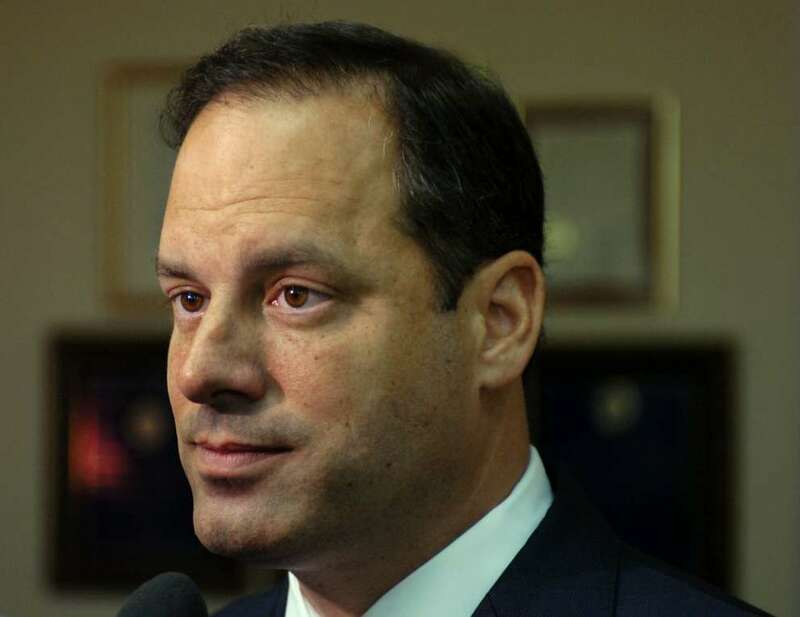 The only elected official named in grand jury subpoenas has been Tallahassee City Commissioner Scott Maddox, the former chairman of the Florida Democratic Party and unsuccessful candidate for attorney general, agriculture commissioner and governor. Earlier this month, the Democrat published a search warrant mistakenly posted on the Northern District of Florida Court's website that revealed Maddox is suspected of bribery and mail fraud. The FBI does not issue press releases declaring politicians innocent of wrongdoing they might be looking into, and public corruption investigations can plod along for years without an indictment or announcement. Fairly or unfairly, this investigation could loom over Gillum well past election day. He has not helped himself by refusing to discuss almost anything about the matter. The Democrat reported in August that an undercover FBI agent may have invited Gillum to attend Hamilton on Broadway and a Mets game. Gillum last week would not even say whether he attended either. "All I can confirm is I never did anything that I didn't pay for," he said, explaining that the FBI did not want him to discuss the case. "All I would ask people do is follow the facts. I have not been mentioned in any one of the subpoenas so far that have been issued, not the public, not the private, not anybody who works for me." Not a terrific campaign slogan: I have not been mentioned so far in any subpoena. He acknowledged the FBI may have suspected him of wrongdoing. 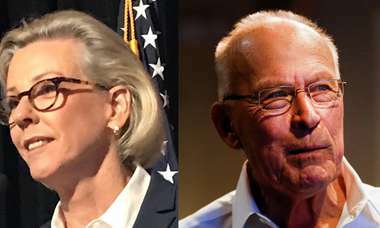 "I have no doubt that if they were on an effort to search out public corruption that they would want to get to know more closely and more intimately the elected officials that they wanted to determine whether or not they could get them or convince them to do something inappropriate. 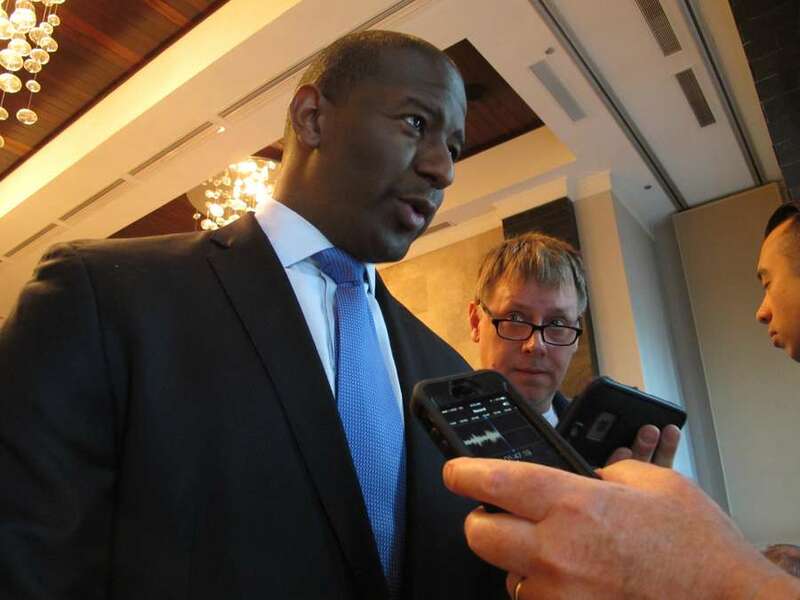 They didn't get that with me, at all," Gillum said. "In fact, most of my interactions with them, as I told the Tallahassee Democrat, were as a result of a trusting relationship that I had with a friend that I had known since our day creating bills in student government (referring to Corey). I regret that by virtue of my trust of him that I allowed people in my space to hang out with me. … But what they will never have and what the facts will never lead to is me having done anything inappropriate, anything illegal." Democratic primary opponents do not directly attack Gillum over the city government scandal, probably out of fear of antagonizing voters. If the investigation appears to remain open and unresolved, though, nobody doubts Republicans will hammer Gillum with it if he is the nominee. "It absolutely worries me what the Republicans would do with that," Hills­borough Democratic chairwoman Townsend said. A campaign spokesman brushed off the concern. "The mayor is the most viable progressive candidate for governor in Florida's history," Geoff Burgan said. "They are going to come after him because he represents a change they don't want: working people with a voice, teachers no longer being called 'evil' and finally standing up to the gun lobby." So far, Gillum's political talent and message are helping him overcome a scandal that would have ended most candidates' primary campaigns. Overcoming photos of him with an undercover FBI agent conducting a corruption probe would be a far greater challenge in the general election.